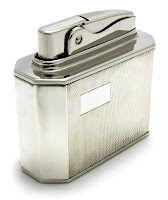 The Ronson 'American Classic' Table Lighter is a modern example of the table lighters manufactured these days. It was manufactured between the year 2001 and 2003 in China and distributed mainly by Ronson in Italy and the USA. 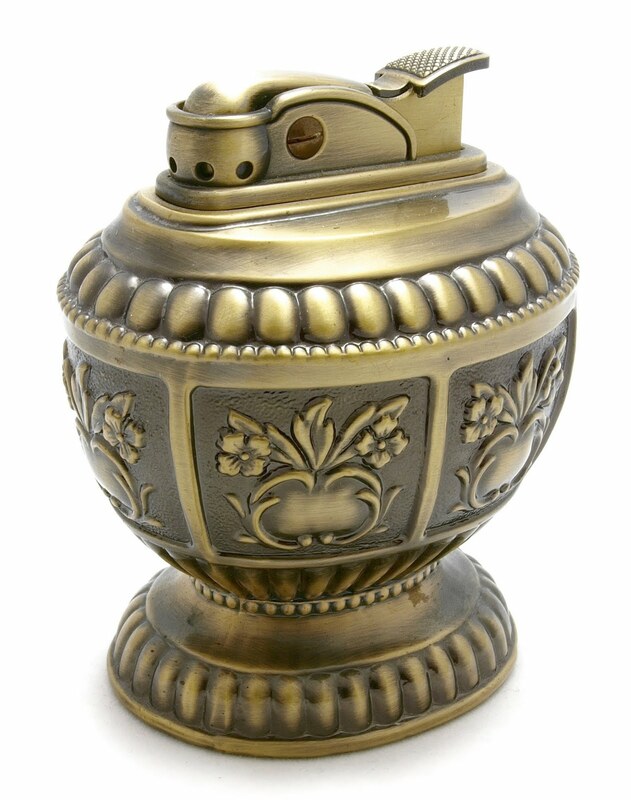 This table lighter has a bronze antique finish with a floral pattern. The base is padded with black velvet. The removable lighter insert – the Ronson Whale – is the successor of the Ronson Varaflame Windmaster which was also equipped with a wind housing. 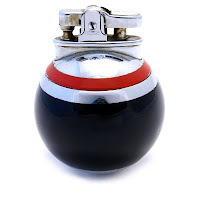 This butane lighter insert has a typical flint ignition and the flame can be controlled. Only the lighter insert is marked: RONSON Whale. 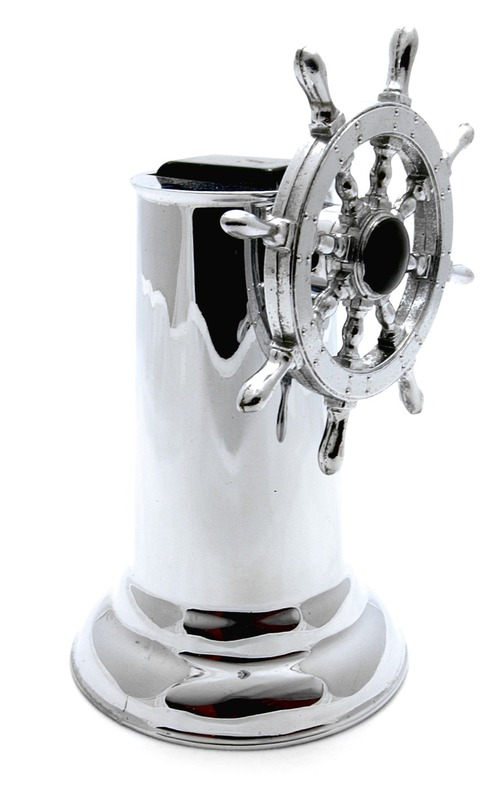 This Ship's Wheel Table Lighter made by Hamilton was first manufactured in 1940 in the United States. 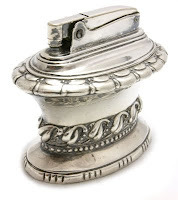 This nautical figural lighter is heavy chrome plated (no. 3QR7561B) - likely the other most famous Hamilton products: the Airplane and the Knight Table Lighter. The top as well the bottom are painted in black. It was though also available in brass finish (no. 3QR7562C) which is rare. A magazine advertisement from the 1940 says: Marine Style-Turn the Wheel-Lights Up. 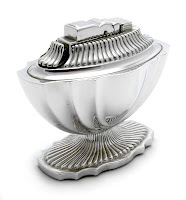 Here's just the right nautical touch for desk, smoking stand or den-a ship's wheel lighter that never misses. Just turn the wheel and it lights up with a steady lighthouse flame. 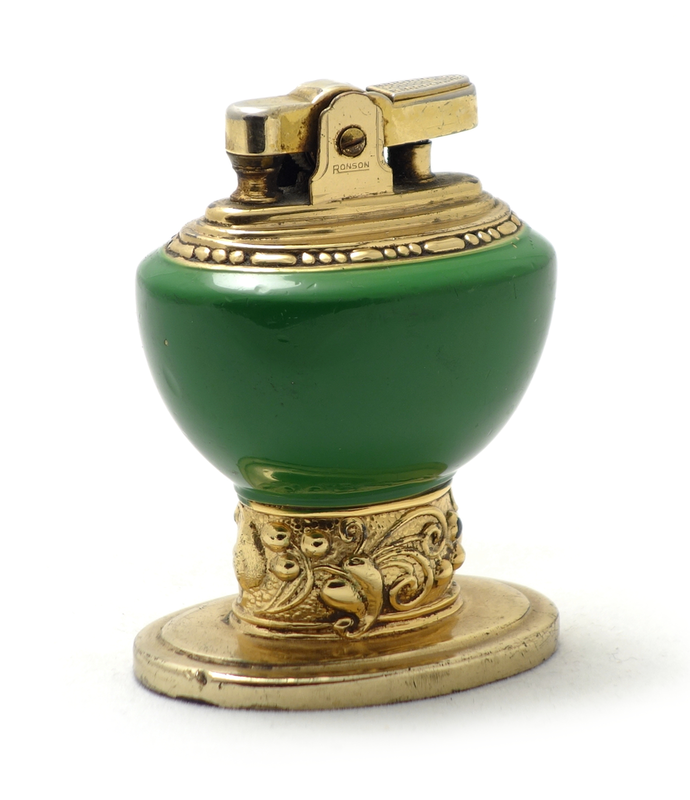 Designed with all the smooth trimness of true marine engineering and finished in brilliant chromium or brass that will not tarnish or stain. Holds oceans of fluid so that it will go week after week without being refilled, lighting up faithfully at the flick of a finger. Lighter stands 5 inches in height. 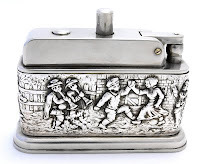 A similar lighter design was used by Dunhill and it is rare. It fetches prices above $250.-. The 'Classic' (model no. 1250 T) was manufactured in 1949 by the American Safety Razor Co. in the United States (Brooklyn, New York). This model was available only in gleaming rhodium finish. 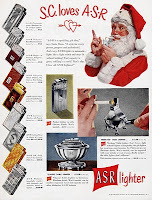 One of the advertisement published in the "Life" magazine in 1949 says about this product: "A·S·R 'Classic' Table Lighter in luxurious Rhodium finish. Won't tarnish, can be machine engraved. Great fuel capacity and all other distinctive A·S·R features." The Ronson Leona was first manufactured in 1949 in Newark, New Jersey, USA. The production ceased in ca. 1955. According to U. Cummings the lighter was named after Leona Aronson who was the wife of Alexander H. Aronson the son of Louis V. Ronson - the founder of the Ronson Corporation. 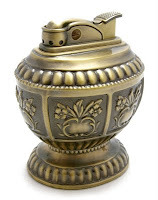 The Dunhill Aladdin's Lamp (also known as the Roman Lamp) lighter was manufactured between 1952 and 1960 in England. It is also known as the Roman Lamp. 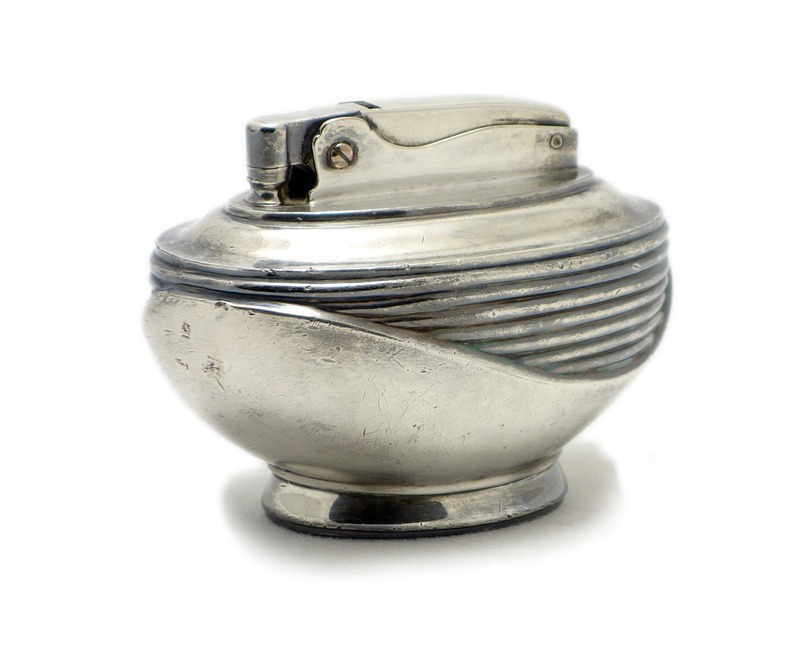 This solid vintage petrol table lighter was manufactured in three different finishes – polished chrome, silver plate and antique copper finish. 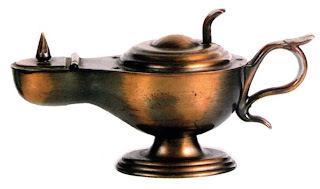 The picture below presents the Aladdin's Lamp in antique brass finish. The lighter has a very precise trigger activated mechanism - the top opens and sparks when the trigger is pulled. Very efficient mechanism – works at every single try. The base is padded with green felt. 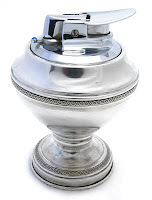 This table lighter was advertised by Dunhill as: An ingenious adaptation of the Ancient "Lucerna" - The Roman Lamp of Imperial Times - to the modern purpose of a Dunhill Lighter. The Varaflame Luralite is one of the 25 different table lighter models of Ronson produced in the second half of the 1960s. 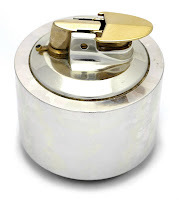 This particular butane lighter model was manufactured in Woodbridge in New Jersey (U.S.A.) between 1967 and 1971. The Varaflame Luralite was available in three finishes: gold, anthracite and silver tone (see picture). The surface of the base of the lighter has a patched pattern. 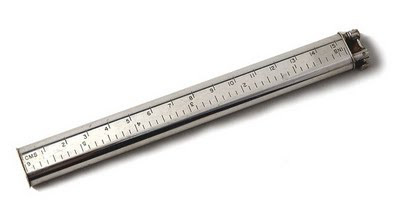 The Dunhill Sylph Ruler was manufactured between 1954 and 1961 in England. In 1955 the name of the lighter was changed to 'Sylph Rulerlite'. This lighter is in the shape of a ruler which is marked both with centimeters and inches. 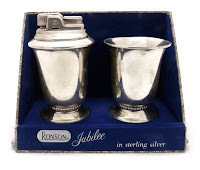 It was produced in two finishes: silver plate and solid silver (sterling). In addition a version with a paper cutter at the end was also marketed in the late 1950s. In the Dunhill catalog from the 1959/1960 the rulerlite was advertised as: A useful, dual-purpose gift, suitable for desk or pocket. Calibrated in inches centimetres. The Zippo Handylite was introduced in 1979. It was manufactured in various finishes till 1999 in Bradford, United States. 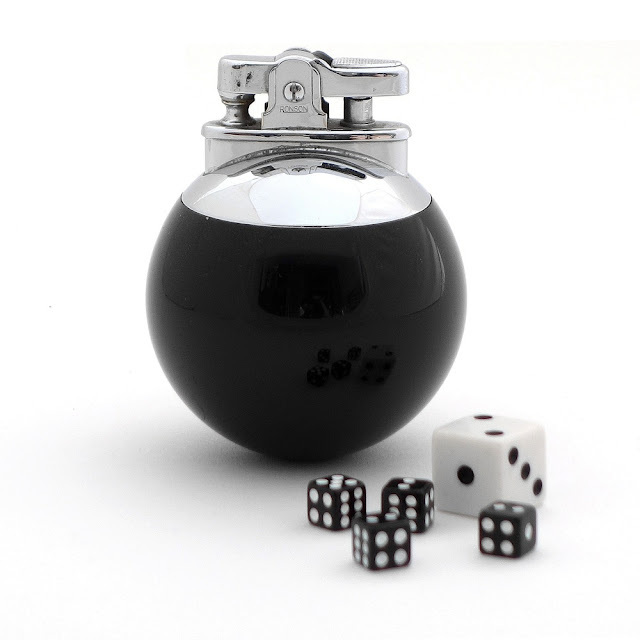 This table lighter is a simple combination of a traditional Zippo pocket lighter and an attachable pedestal base. High Polish Gold Electroplate with Snoozin' Camel. 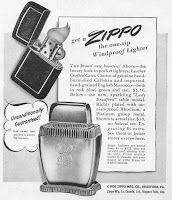 See also the Zippo Handilite magazine advertisement. The Ronson Waldorf was first manufactured in 1936 in Newark, N.J., USA. There are two versions of this table lighter. The first was produced between 1936–1937 and the second, which is less scarce, between 1950–1952 (see picture). Both versions used the Ronson Adonis fitment. 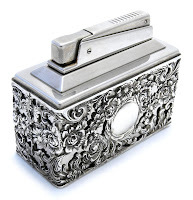 This wick lighter is quite heavy – it is made of "white metal" which is silver-plated. The base is padded with green felt. The lighter base has an oval shape and its leitmotiv is a band of leaves. The second version of the Waldorf was sold alone and in a set consisting of a matching tray and cigarette holder. The Zippo Lady Barbara was first released as a 65th Anniversary model lighter in 1997 - it had an etched 65th Anniversary logo on the front (see picture). Lady Barbara was manufactured in three different finishes till 2003 in Bradford, United States. 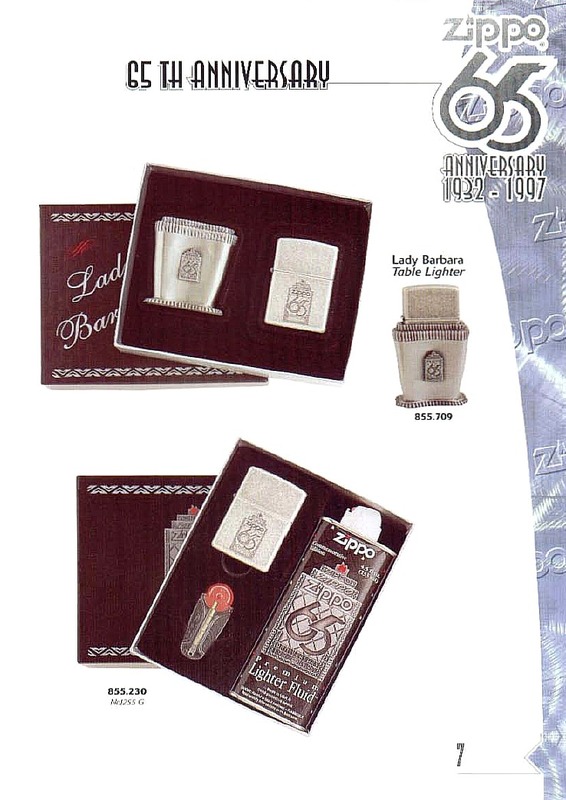 The Lady Barbara Classic Antique has a silver plate antique finish and was manufactured between 1998-2003 and it replicated the classic 1949-51 Zippo Lady Bradford design. Beside the Anniversary model and the Classic Antique model there is a Camel model with a etched Camel logo on the front. 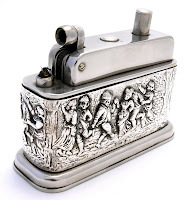 This modern antiqued silver plate lighter can be removed from the Lady Barbara pewter base and used as a normal Zippo pocket lighter. The base is padded with black felt and it is marked: ZIPPO (R) Bradford, PA USA. This Zippo might be a classic though it looks awkward and feels quite cheap. Below the product page of the 65th Anniversary Zippo Table Lighter from the German Zippo Collection Catalog 1997/1998 Classics/Selects. Lighters collectors are usually both buyers and sellers. Some of them collect lighters because of self-actualization, some of them think about their grandchildren and others perceive it as an investment or just as a alternative for paper money. Investing as well as speculation requires knowledge, luck and taste. 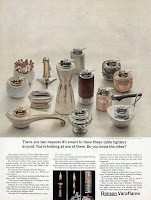 It refers also to vintage cigarette lighters. You probably won't be a millionaire though you can benefit on your unique knowledge on lighters. How? What kind of profit do we talk about? 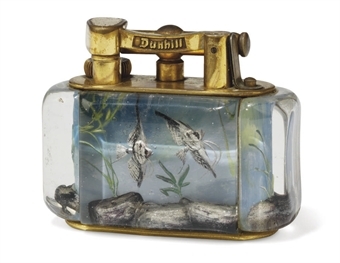 Let's consider you have bought a Dunhill ‘Aquarium’ lighter on a garage sale for $20 in excellent condition five years ago. The previous owners did not know that this table lighter was something special - they even did not know where to find any information about it. It would help to know that this lighter was manufactured in relatively small amounts in England in the 1950's and that it was hand-painted by Ben Shillingford. So you have made a fantastic deal from todays perspective. Such bargains happen also today though the future will change it. 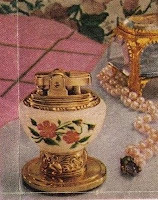 The main reason for it is the wide-spreading Internet and easy accessible sources on vintage lighters. Additionally there number of people who find collecting lighters amusing rises. The limited supply and rising demand causes that the prices of particular examples of lighters will go up. Going back to our story, three years ago you decided to sell it on ebay as the prices for it was astonishing high - average price for it (excellent condition) was at $1700-1900. You sold it though you still have monitored the market for the Aquarium Dunhills just for curiosity. You are not happy anymore, because since than the dissonance of your decision rose. Why? Because the price you could get was also rising and now you would get for it more than $3300. There are more examples of lighters that experienced such astonishing value appreciation. This list should help to organize the major lighters manufacturers (makers) all over the world and assign the years when the companies were active. 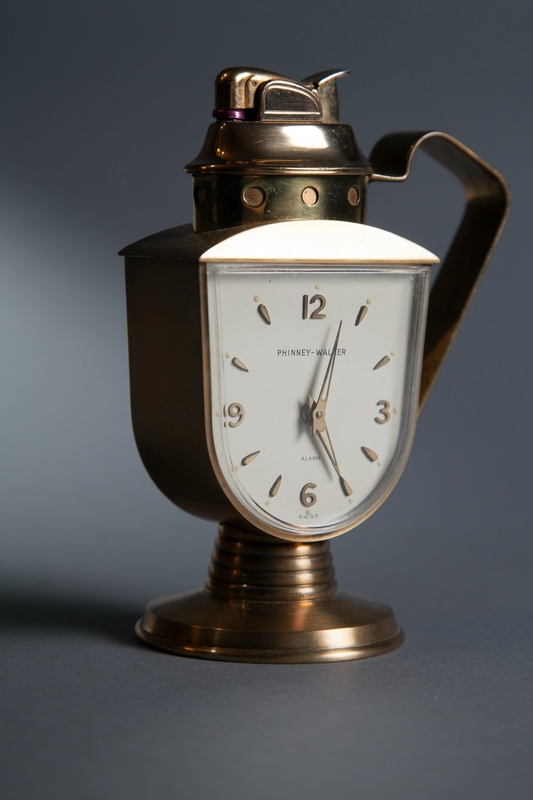 This Ronson Puritan was first manufactured in 1936. It was only produced in Newark, N.J. (U.S.). 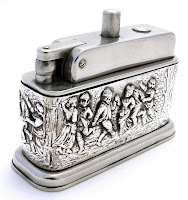 There are at least three different versions of this lighter – they vary mainly in some details in the upper part. 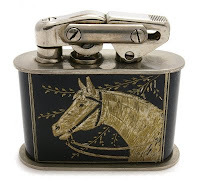 On the first spot it is easy to confuse this lighter with the earliest versions of the Ronson Decanter – the only difference is the four legged base. This wick lighter has a radiused rim on the top. It is twice as light as the Ronson Decanter though the dimensions are almost the same. 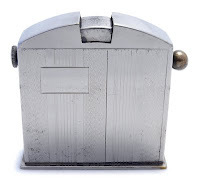 The Puritan is a handy lighter designed in the Art Deco style. 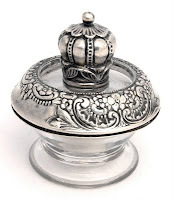 It is covered with a thick layer of silver which is additionally protected by a transparent lacquer which often is partly deteriorated. The four-legged base is padded with green felt. The Ronson Puritan was also sold in 1949 in 2-piece (cigarette holder + lighter) and 3-piece set (tray + cigarette holder + lighter). I saw them only once. 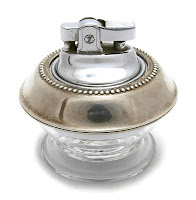 The 'Bulb' table lighter was manufactured in ca. 1954. 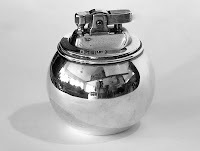 The base of the lighter is in the shape of a bulb and it is made of glass (not crystal glass) and silver sterling (925). It has a sterling plain rim with raised beading around the inside edge and marked 'STERLING'. The maker of this lighter is unknown though the base was most probably manufactured whether in Japan or in the United States. 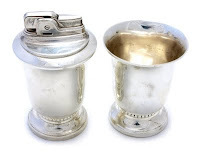 The lighter was also sold with a matching ashtray and cigarette urn. The set is very similar from the shape on to the previous described Hy Glo & Frank M. Whiting, glass and sterling, 1931. The lighter insert is a standard chrome plate insert made in Japan. Marked on the bottom 'JAPAN'. The "Florentine Dagger" was manufactured in 1952 by the American Safety Razor Co. in the United States (Brooklyn, New York). It is a fine example of a mid-century multipurpose Ascot product which combines a lighter, paper weight and a letter opener. 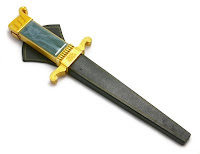 In desperate moments it can also be used as a dagger – a short bladed stabbing weapon. It was available in four different finishes – with faux green, black, gold and jade marble-like plastic handle. 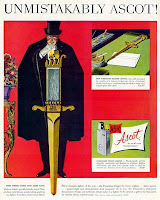 One of the advertisement published in the "Life" magazine in 1952 says about this product: "Most dramatic lighter of the year - the Florentine Dagger by Ascot. Lighter... letter opener... paperweight and distinguished desk ornament all in one, the Florentine's distinctive Renaissance design and authentic detail make it a lighter to be prized, a gift to be treasured. At smarter stores, coast-to-coast."